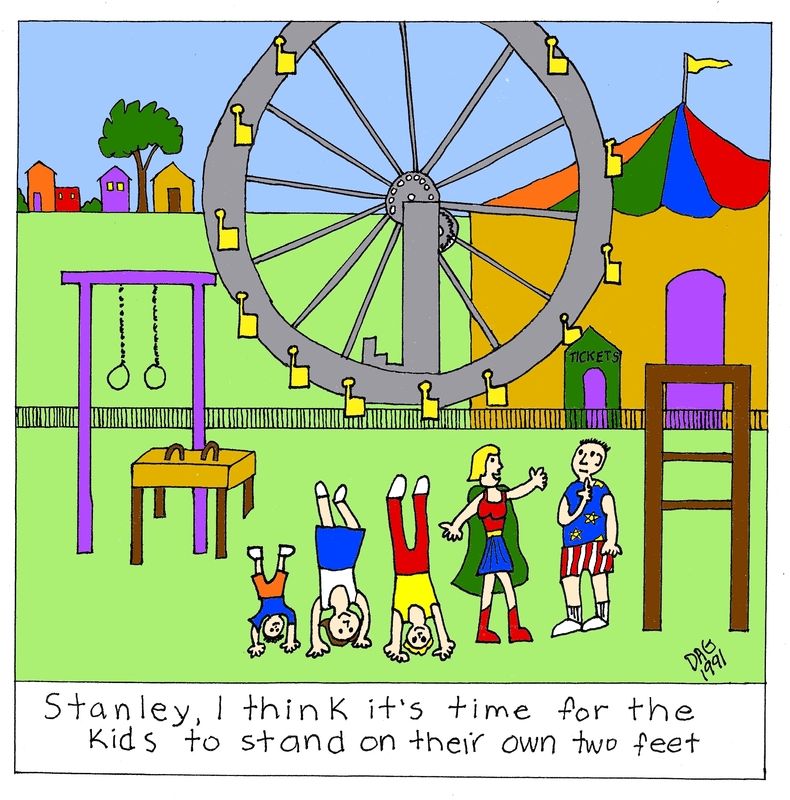 Parents just want their kids to have fun and be happy, every day, all day. Not possible; besides a parent’s job is training to their kids to survive in real life. Thank you, Carl D’Agastino for being one of my cartoonist friends who lets me have my way with their cartoons. Laughing keeps us strong. Surviving in real life means tolerating the times things don’t go you way, you get bitten by a bumble bee, or visited by a traumatic life blow. I did a recent Emotional Fitness Training Post about Practicing Imperfection. Before moving on to some the rest of this blog, you might want to read that post. Why? Too many parenting gurus have raised the goal post for good enough parenting so high, we all fail. The end result? Too many kids have wandered on to the Victim-hood Path. Fun matters. In fact as many of you know, Laugh and Play is one of my Daily Emotional Fitness Exercises. Moreover, play with your child promotes bonding. Why else did nature make grownups so eager to play peek-a-boo and pat-a-cake with babies, not just their own but with almost any baby they see that smiles at them. Two major schools (the behaviorists and the followers of Freud) when trying to explain human behavior agree only on one thing – behavior is driven by the need to avoid pain and feel pleasure. One of Freud’s followers goes so far as to say you can trace any unacceptable behavior back to pain of some sort or the fear of a future pain of some sort. I agree with this theorist and challenged my student to present me with any behavior they did not understand and I would related it to pain or fear of pain. I promised a quick A in the course, if I failed to convince most in the class I had failed. No one got such an A.
Deprivation of a physical need – food, warmth, shelter, sexual release. Physical pain either through accident, assault, or illness. Emotional pain – including feeling unloved, unworthy, dissed from another; but just as easily feeling beset by your own conscience and thinking you are inadequate, stupid, not in control, or bad; but also can involve feeling you have been treated unjustly. Uncertainty – which is often fear of future pain but just as often can be related in one way or another to the above sources of pain. How does this related to parenting? Parents need to focus as much on helping their children develop the ability to tolerate discomfort and pain. Doing so is far more important than trying to see that you child is always happy. 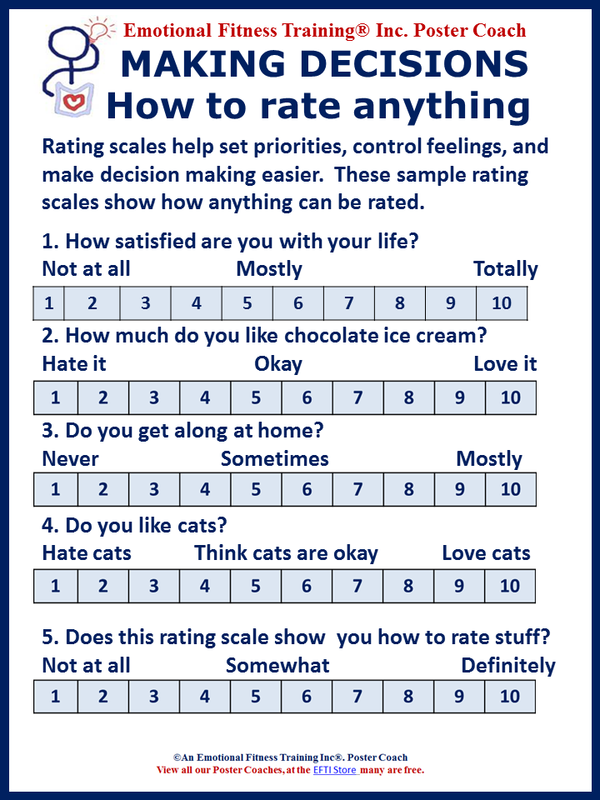 Parenting tip two: Teach how to rate things including how to rate pain. As always you need to model what you teach. Bad news? Not really for by teaching these skills strengthens them. As you teach your child, you will increase your ability to tolerate pain and add to your ability to enjoy the good. As this poster coach shows, anything can be rated. If you haven’t done this and your child is in school or a teen, worry not. Just take a more direct approach. Parenting tip three: Teach and model what matters. The media makes it seem like all that matters are how we look or what we own, the grades we get, or the awards we win. Not true. As I so often notice the researchers and the sages of the ages know that matters most is practicing kindness. That means first being kind to yourself, but also being kind to others. Being kind to others does not mean allowing abuse, that needs to be made clear which is why I also preach teaching your children self-defense skills. These tips are not magic, but following them will keep your children off the victim path so you can indulge them when and how you are able. The Name for my sandwich would be Healthy Indulgence Sandwich. The recipe? Any whole grain bread, two slices of Swiss cheese, tomato slices and arugula, all slathered with avocado mayonnaise. That would be so healthy you could later indulge in my favorite night-time treat. A Sweet and Salty Sundae. A scoop of vanilla ice cream, covered generously with lite maple syrup then sprinkled with salt and covered with whip cream. For other healthy indulgences visit this EFTI Pinterest page. Like any coach, EFTI’s poster coaches inspire, teach, motivate, and reinforce thinking about what matters. Poster Coaches can also be used at Family Meetings to start a discussion about what matters. Most are free now, but I do plan to start charging for most in the near future. To use, print up in color and post there it will be seen often. If not soon if for you, let me know and I will give it priority status or email a copy. This entry was posted in Parenting Issues and tagged children, Emotional fitness, Emotional Fitness Training, emotional intelligence, Health and mental health, Indulging or spoiling, Katherine Gordy Levine, Parenting advice, parenting tips, parents, postaday, teens, When Good Kids Do Bad Things. Bookmark the permalink.